We don't always want to live on base at our spouse’s duty station. In fact, we often look for property outside the gate to provide some space between work and home. But just because we need a little space doesn't mean that we want to disconnect from the military community entirely! And that's why I turned to a few fellow military spouses to learn how they maintain their military ties. Here are 7 things your fellow military spouses recommend you do if you want to stay connected with your military community while living and working off base. 1) Live in a military community off base! You don’t have to live on base to live in a military community. In fact, you will often see families congregate to certain neighborhoods near the base. Living in these areas will help you maintain a little space from work like you desire, but stay close to the community. 2) Join the squadron/unit/command Facebook group and spouse club. Facebook often informs you of events your local spouse club organizes. These events include dinner, Bunco, girls' night out, and whatever other creative events your local group comes up with! This is not only a great way to involve yourself in the community as a whole, but can also make stronger connections leading to more lasting and intimate friendships. 3) Read the base newspaper! You can pick this up at the commissary or exchange. Also check out the bulletin boards for MWR events and groups organized on base. 4) Join a parents' play date group. When you live off base as a stay-at-home parent, it becomes easy to feel a little isolated. 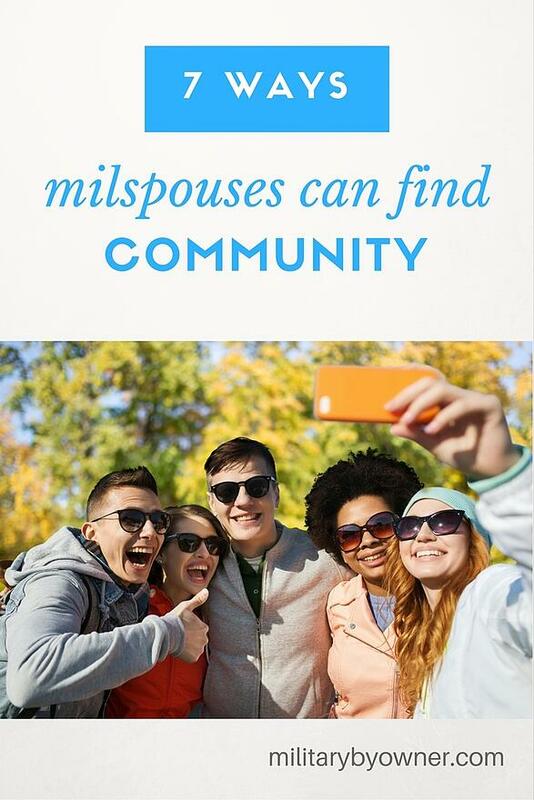 One thing you can do is join a parents' group and get together with other spouses. Lizann’s group would meet both on and off base and were able to help each other through deployments. She also joined Stroller Warriors which kept her active and involved in the community as well. 5) Go to command functions. Attend the hails and farewells, command BBQ, family day, lunch time/after work command softball games. These events may sometimes seem like a chore, but they are designed to strengthen the community by inviting everyone to celebrate together, play together, eat together, welcome newcomers together, and say our goodbyes together. Don't let these events become a burden; instead, let them bring you closer to your military community. One of the best ways you can get involved in your community is to volunteer. If you have the time, commit one day a week or a couple events a month to help out with. Chances are, there are more ways than you think that you can volunteer. 7) Think outside the box. If you came from an amazing on-base community previously, but have since moved and now find yourself living 'outside the wire,' it's best not to compare experiences. You may have to try a little harder or explore some different activities than you did in the past, but it is possible to stay connected with your military community! Try any of these 7 things your fellow military spouses suggested, and you may find it much easier to stay connected in your community while living and working off base!